Automatically record radio shows, stations - including Sirius/XM, BBC, NPR - and podcasts. Choose from 1000s of radio show/station listings in the Replay Radio Media Guide. The guide is updated regularly so all listings are current. Discover new shows or re-discover old favorites. Convert your recordings to all the popular formats and enjoy them when and where you like. Replay Radio is the ultimate easy-to-use radio recorder. Just pick a show or station from the built-in guide, and Replay Radio schedules and automatically records the show for you. Then listen on-demand from your phone, tablet or PC. For mobile phones and tablets, Replay Radio supports DropBox, Google Drive or SkyDrive for syncing your recorded audio files. Awesome. Try it today! 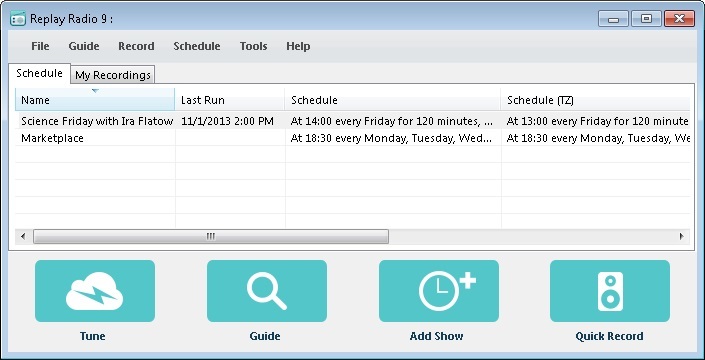 Added new splitting functions: split long recordings at regular intervals or at specific times. Better conversion support. Now can record from line-in. Support for audio splitting and "at complete" schedule events. Fix for shorthand timestamp naming in split recordings. Other general bug fixes.